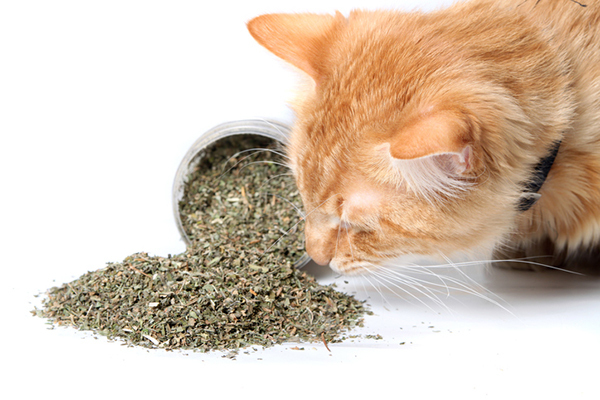 Next on The Scoop: Do You Ever Drop Everything to Attend to Your Cats? With a cute round face, an outgoing disposition, and a kind personality, it’s not at all surprising that the Scottish Fold is the 17th most-popular breed in the Cat Fanciers’ Association’s registry. Here’s the scoop on this pixie among cats. The progenitor of the Scottish Fold breed, a white barn cat named Susie, was discovered by Scottish shepherd and cat fancier William Ross in 1961. When Susie had kittens, Ross adopted one of them and began working with geneticists and other cat fanciers to breed his fold-eared kitten to Persians, American Shorthairs, Exotic Shorthairs, and Burmese cats to create the round, sweet look of the Scottish Fold. In 1966 he registered the Scottish Fold with Britain’s Governing Council of the Cat Fancy. The breed is not without controversy. It was not accepted by any European cat fanciers’ groups and even the GCCF withdrew registrations in 1971 after a correlation between the gene that causes folded ears and a crippling limb deformity was discovered. This didn’t stop American cat fanciers, who imported the first Folds to the U.S. in 1970. 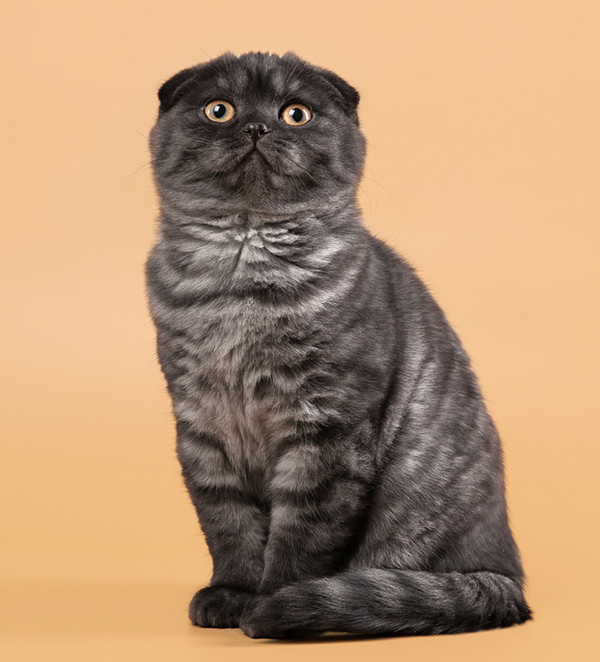 The breed quickly gained popularity, and the Scottish Fold is accepted for championship status in the Cat Fanciers’ Association and The International Cat Association. Due to outcrossing with so many different breeds, Scottish Folds come in just about every color in the feline fur spectrum. Their eyes also come in all colors, but coppery shades seem to be the most common. Male Scottish Folds generally weigh between nine and 13 pounds, while females weigh in at six to nine pounds. Some Scottish Folds have straight ears. 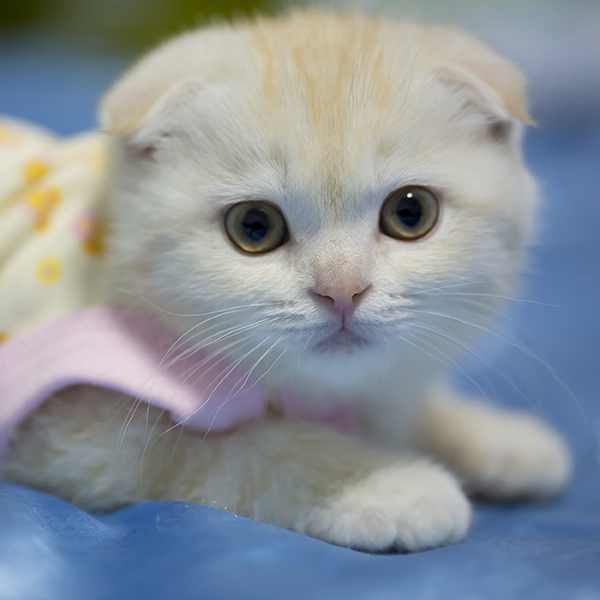 The gene that produces folded ears is an incomplete dominant, meaning that the majority of Scottish Fold kittens will have folded ears, but a substantial minority will have straight ears. Although a well-cared-for indoor Scottish Fold can live to an average age of 15 years, the breed is prone to some health issues. First, the folded ears can make the breed more prone to ear mites, wax buildup, and possibly infections. The more serious concern is related to the very reason Folds have those folded ears. Osteochondrodysplasia (OCD) is an inherited condition that causes abnormalities in bone and cartilage development, and in studies done to date, all folded cats have it. Kittens bred from matings of two folded cats have it worst, and develop severely painful degenerative joint disease at a very young age. 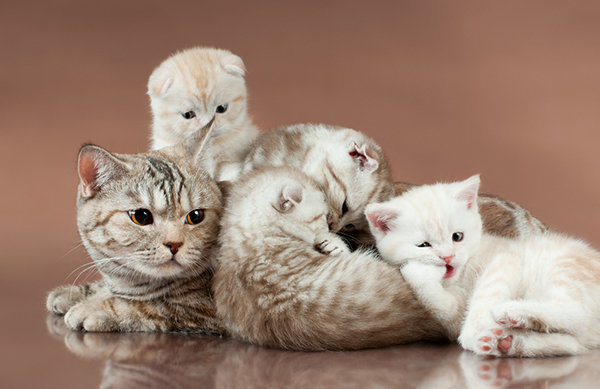 Kittens from folded and non-folded breedings also have it but don’t generally start showing signs of the defect until a later age or remain asymptomatic. 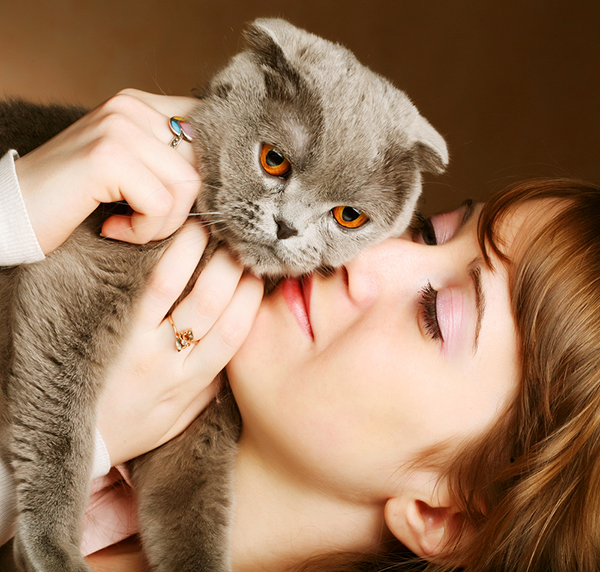 Your Scottish Fold is an intelligent and inquisitive kitty who will be happy to follow you everywhere. She’s not a super high-energy cat like, say, a Bengal, but she enjoys playing and exploring cabinets. She’s a relaxed girl, too; she gets along well with older kids, other cats, and dogs, and she’ll make a great travel companion. She may be a bit of a chatterbox, but her voice is quiet and melodious. Folds have a tendency to gain excess weight, so be sure to exercise her regularly and monitor her diet. Clean her ears regularly — have your vet show you how to do it without damaging the ears or the eardrum — to prevent wax buildup, and give her a brushing once a week or so to keep her sleek and shiny. Scottish Folds were originally called Lops, as in “lop-eared rabbit,” a rabbit whose ears hang down by the side of its head. 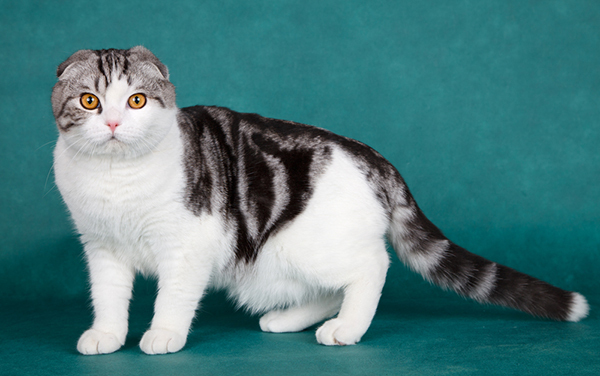 The breed wasn’t called the Scottish Fold until 1966 when it was registered with the GCCF. All Scottish Fold kittens are born with straight ears. In cats with the fold gene, the ears begin to fold between 18 and 24 days after birth. There’s a long-haired version of the Scottish Fold. Depending on the breed registry, it’s called the Highland Fold, Scottish Fold Longhair, Longhair Fold, or Coupari. 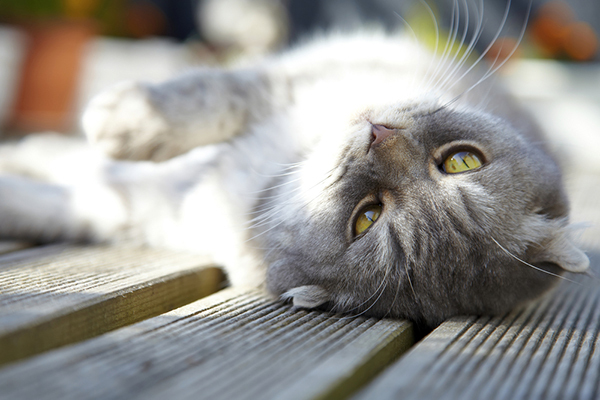 Do you have a Scottish Fold in your home? What’s it like to live with her? Please share your thoughts and photos of your Scottish Fold in the comments. About JaneA Kelley: Punk-rock cat mom, science nerd, animal rescue volunteer and all-around geek with a passion for bad puns, intelligent conversation, and role-play adventure games. She gratefully and gracefully accepts her status as chief cat slave for her family of feline bloggers, who have been writing their award-winning cat advice blog, Paws and Effect, since 2003.